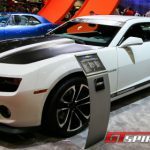 Developed in a similar vein to the racing-intended Camaro V8 Performance Concept, this Camaro Performance V6 concept of a track-capable Camaro uses a 323-horsepower LFX V6 engine and is shown at the SEMA 2012 show. The concept uses a blend of components available from Chevrolet Performance, such as the ZL1 Brake Conversion Kit and Camaro 1LE suspension kit, as well as the rear differential from the Camaro 1LE. 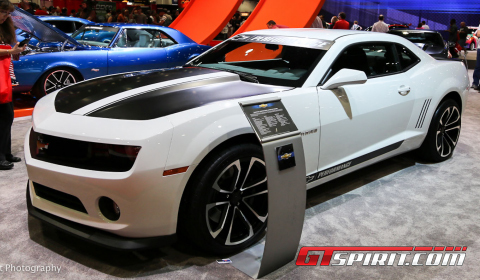 Additional features on this Summit White concept Camaro include a Chevrolet Performance shock tower brace, Camaro ZL1 dual-mode exhaust system and rear diffuser, Camaro convertible rear spoiler in matte black, Chevrolet Accessories heritage grille painted matte black and a Camaro Dusk front splitter in matte black. Other parts are an upper front fascia blackout graphic, matte black hood wrap with exposed Summit White stripe and Chevrolet Accessories 20×10 inch (front) and 20×11 inch (rear) ten-spoke black wheels with milled faces. Inside the cabin, the concept has summit White door panel and instrument panel inserts, Chevrolet Accessories lighting package, pedal covers and Camaro-logo premium floor mats. Other parts in the interior are a Concept Chevrolet Performance embroidered console lid and sill plates, Concept Chevrolet Performance logo on the instrument panel insert and a Production RS gauge package.